New iPod nano to get rear-facing camera? Not content with adding cameras to the iPad 2, Apple may be shoe-horning a camera into the next-generation iPod nano. 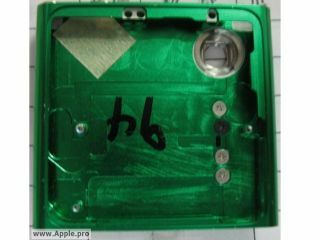 A photo of what is apparently a part of the new iPod nano has surfaced, which suggests that a camera will make an appearance on the new MP3 player, while keeping the device and screen sizes the same as the current one. The photo shows a camera hole in the corner of the part, which means we'll probably see a rear-mounted camera as opposed to the downward-facing video camera on the sixth-gen iPod nano. It does seem like a slight back-track from Apple, given that the video camera was scrapped from the current batch of nanos. But we're not entirely surprised to see more cameras popping up on portable Apple devices thanks to the growing love for applications like FaceTime. We should see the next batch of iPods revealed in September, so if you're desperate for a tiny camera-toting MP3 player to make you feel like a giant, there's just a few months to go.